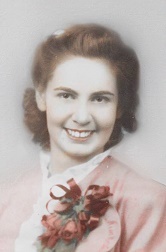 Marie Wilson Musgrave, 94, of Kansas City, MO, passed away Saturday, August 18, 2018 in Shawnee, KS. Marie was born in Toronto, Kansas and graduated from Chase High School in 1941. She attended Fort Hays State for two years and married Duane Musgrave in 1944 in Little Rock, AR. Marie previously lived in Chase, Kansas and Sedan, Kansas. She had a love of travel and an active interest in genealogy. Her travels took her to all 50 states and to all continents except Australia and Antarctica. As a genealogist, Marie researched and wrote six books on the Musgrave-Wilson families. Paramount in Marie’s life was her love of family and family connections. She made a point to stay in touch with family and friends through the years but mostly she liked to be a mom. She listened to her children’s stories, laughed at their jokes and planned both large family gatherings and small picnics on the porch. All the grandchildren looked forward to annual visits with Grandma and Grandpa. Marie was preceded in death by her parents William C. Wilson and Zoe Henley Wilson, by her husband of nearly 48 years, Duane, by her youngest son, Tom of Lacrosse KS, and by twin great grandsons, Colin and Logan Musgrave. She is survived by her sister, Ella Mae Sharpe of Mulvane, KS, her son and daughter-in-law, Curt and Jeanne Musgrave of Kansas City MO, her son and daughter-in-law, Bill and Debbie Musgrave of Carbondale, KS, and her daughter and son-in-law, Linda and David Bever of Wichita, KS. Marie is also survived by 15 grandchildren, 33 great grandchildren, and 3 great-great grandchildren. Services will be 2:00 P.M., Saturday, August 25, 2018 at Community Presbyterian Church, Chase, Kansas with Rev. Jesse and Arlene Patrick officiating. Visitation will be from 12:00 to 2:00 P.M., Saturday, August 25, 2018 at Community Presbyterian Church with family present. Memorials may be made to KC Hospice and Palliative Care, KC Hospice Foundations KCHPC 1500 Meadow Lake Parkway, Suite 200, Kansas City, MO 64114 or Community Presbyterian Church, Chase, KS in care of Birzer Funeral Home, 214 West Ave. South, Lyons, KS 67554.